Note: Unusually, the title is not displayed on the front cover (but does appear on the back cover and spine). 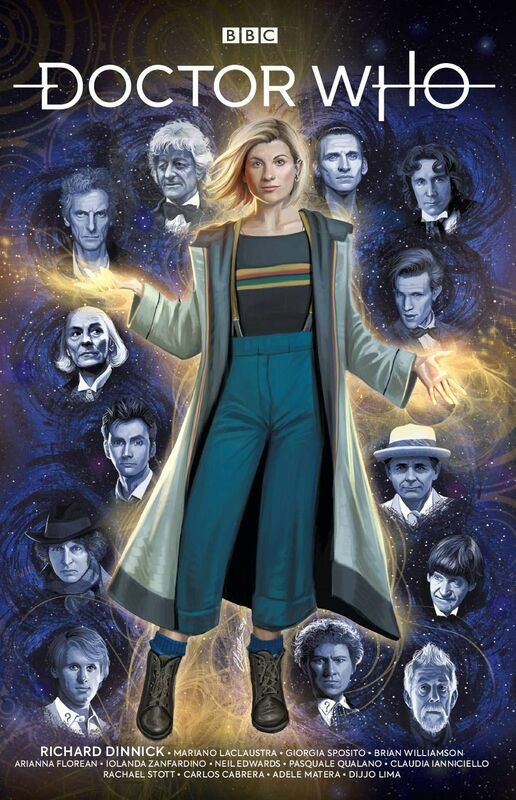 It also describes itself as "Issue 0" of the Thirteenth Doctor comic series. "That's the trouble with regeneration... You never quite know what you're going to get!" The ultimate celebration of Doctor Who, for fans old and new! As the Doctor regenerates into their Thirteenth incarnation, they flash back across their many lives and many adventures — revealing brand-new stories from every era and face of the Doctor to date! Written by Richard Dinnick (The Twelfth Doctor) and illustrated by a fantastic selection of mind-blowing artists, this is the perfect introduction to Doctor Who for new readers, and the ultimate celebration of the series for long-term fans! Not just an ideal starting point for the era of the Thirteenth Doctor, as played by Jodie Whittaker, this collection is also an amazing doorway into a whole universe of Doctor Who comic book adventures! Doctor Who: Thirteenth Doctor #0 is 100% all-new comic strip material!